Not to be confused with Betta. "β" redirects here. For the German eszett, see ß. For the Chinese radical, see 阝. For other uses, see Beta (disambiguation). Beta (UK: /ˈbiːtə/, US: /ˈbeɪtə/; uppercase Β, lowercase β, or cursive ϐ; Ancient Greek: βῆτα, translit. bē̂ta or Greek: βήτα vita) is the second letter of the Greek alphabet. In the system of Greek numerals it has a value of 2. In Ancient Greek, beta represented the voiced bilabial plosive /b/. In Modern Greek, it represents the voiced labiodental fricative /v/. Letters that arose from beta include the Roman letter ⟨B⟩ and the Cyrillic letters ⟨Б⟩ and ⟨В⟩. Like the names of most other Greek letters, the name of beta was adopted from the acrophonic name of the corresponding letter in Phoenician, which was the common Semitic word *bait ('house'). 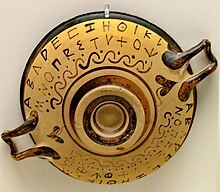 In Greek, the name was βῆτα bêta, pronounced [bɛ̂ːta] in Ancient Greek. It is spelled βήτα in modern monotonic orthography and pronounced [ˈvita]. The letter beta was derived from the Phoenician letter beth . The letter Β had the largest number of highly divergent local forms. Besides the standard form (either rounded or pointed, ), there were forms as varied as (Gortyn), and (Thera), (Argos), (Melos), (Corinth), (Megara, Byzantium), (Cyclades). In the system of Greek numerals, beta has a value of 2. Such use is denoted by a number mark: Β′. Beta is used in finance as a measure of investment portfolio risk. Beta in this context is calculated as the covariance of the portfolio's returns with its benchmark's returns, divided by the variance of the benchmark's returns. A beta of 1.5 means that for every 1% change in the value of the benchmark, the portfolio's value changes by 1.5%. In the International Phonetic Alphabet, Greek minuscule beta denotes a voiced bilabial fricative [β]. A superscript version may also indicate a compressed vowel, like [ɯᵝ]. The name Beta was used as a name during the 2005 Atlantic hurricane season as Hurricane Beta. Beta is often used to denote a variable in mathematics and physics, where it often has specific meanings for certain applications. In physics a stream of unbound energetic electrons is commonly referred to as beta radiation or beta rays. In regression analysis, ⟨B⟩ symbolizes nonstandardized partial slope coefficients, whereas ⟨β⟩ represents standardized (standard deviation-score form) coefficients; in both cases, the coefficients reflect the change in the criterion Y per one-unit change in the value of the associated predictor X.
β is sometimes used as a placeholder for an ordinal number if α is already used. In spaceflight, beta angle describes the angle between the orbit plane of a spacecraft or other body and the vector from the sun. The term "beta" refers to advice on how to successfully complete a particular climbing route, boulder problem, or crux sequence. In statistics, beta may represent type II error, or regression slope. In some high-quality typesetting, especially in the French tradition, a typographic variant of the lowercase letter without a descender is used within a word for ancient Greek: βίβλος is printed βίϐλος. In typesetting technical literature, it is a commonly made mistake to use the German letter ß (a s–z or s–s ligature) as a replacement for β. The two letters resemble each other in some fonts, but they are unrelated. "Beta" can be used to refer to several consumer and professional videotape formats developed by Japan's Sony Corporation. Although similarly named, they are very different in function and obsolescence. Betamax was the name of a domestic videotape format developed in the 1970s and 1980s. It competed with the Video Home System (VHS) format developed by the Japanese Victor Company, to which it eventually succumbed. The Betamax format was also marketed Betacord by (Sanyo); some cassettes were simply labeled "Beta." Betamax lost in the market and is an oft-used example of a technically superior solution that failed due to market forces. Betacam, including Beta SP and DigiBeta, is a family of professional videotape formats launched in 1982 that was the de facto standard for professional video, advertising, and television production through the 2000s. The formats outlasted analog NTSC television, and their scarcity today is because the industry has moved to HD formats. Look up Β or β in Wiktionary, the free dictionary. ^ Jeffery 1961, p. 23. ^ Haralambous, Yannis (1999). "From Unicode to typography, a case study: the Greek script" (PDF). p. 7. Archived from the original (PDF) on 2011-06-15. ^ Aguilar Ruiz, Manuel José (2013). ""Las normas ortográficas y ortotipográficas de la nueva Ortografía de la lengua española (2010) aplicadas a las publicaciones biomédicas en español: una visión de conjunto" (PDF). Panace. 14 (37): 104. This page was last edited on 15 April 2019, at 17:14 (UTC).